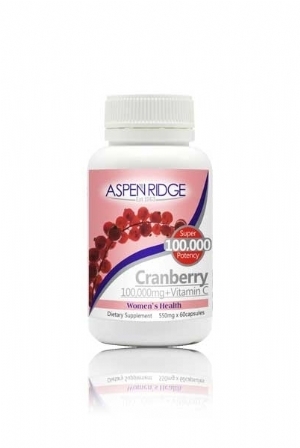 Aspen Ridge Cranberry 100,000mg with Vitamin C is formulated for Womens health needs. Cranberry naturally helps the elimination or bacteria from the bladder and the masking of urinary odours. This unique combination of antioxidants and phytonutrients may also provide cardiovascular support. 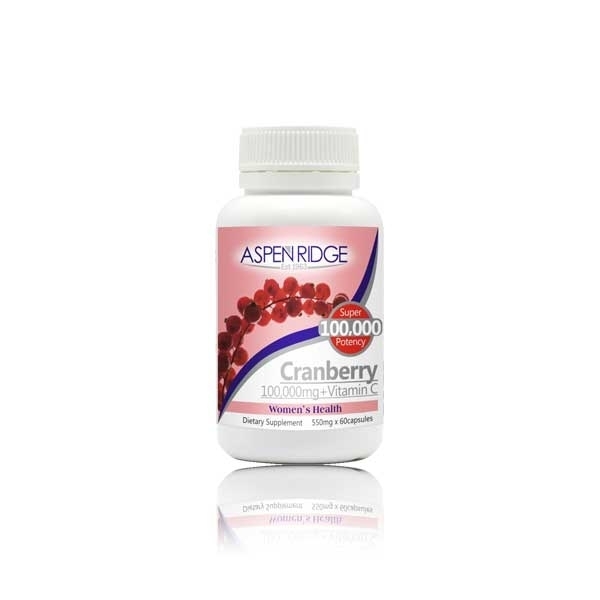 Cranberry supports urinary and intestinal health. Cranberry provides a unique cleansing action for the digestive tract, with detoxifying and fluid balanacing support. Added Vitamin C provides support for the immune system and helps to slow and prevent cell damage for healthy body tissue. Always read the label and use as directed. If symptoms persist see you healthcare professional. Adults take 1 capsule a day with food. If symptoms persist associated with urinary excretion such as high fever, intense burning or vomiting, see a doctor immediately. Check with your healthcare professional before consumption if you currently take: Warfarin medication. Medications changed by the liver.